OK, enough with the setup--now that we know the distribution of the data, we can can begin modeling. If we wanted to model the relationship between the count of page views and the other three variables, we would use a negative binomial model. Let's make our task a bit simpler by just looking at the probability that the post is in the top 2000 (in other words, that it had over 20 direct page views, as distinct from visitors to the TMC's homepage). [Skip this paragraph if not familiar with statistical analysis.] To do this, I ran a logistic regression of page views on tweets, likes, and comments. I then created 3 scenarios in which one of the variables is at its mean (rounded to the nearest integer) and the other two are at zero. For example, the tweets scenario (blue in the plot below) estimates the probability that a post is in the top 2000 given that it was tweeted 8 times, liked 0 times, and commented on 0 times. These scenarios account for uncertainty in the coefficient of interest using 1000 simulations. Note that the means used differ from those displayed with the density plots above since I used the mean for the whole sample, not just the most popular posts. So how are tweets/likes/comments associated with the popularity of a post? 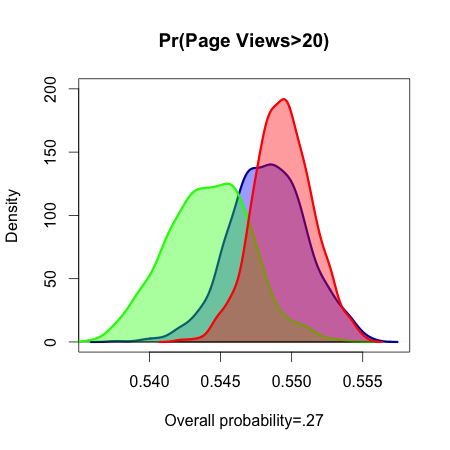 As the plot below shows, an increased level of one form of reader activity predicts that a post is twice as likely as average to be ranked among the most popular--even while holding the other two levels of reader activity at zero. 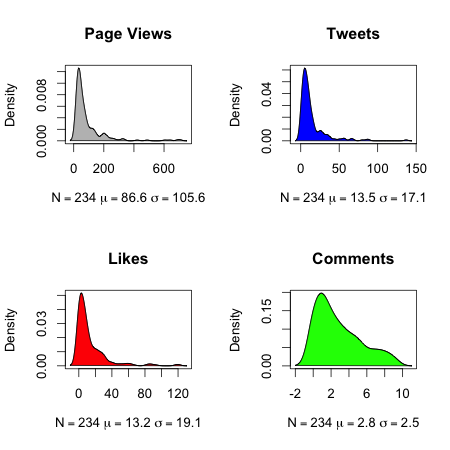 As the plot shows, likes have the closest correlation with the popularity of posts, followed closely by tweets (indicated by the overlap of the probability densities). Comments have a similar but slightly lower association, but this could be due to the fact that comments fall within a much narrower range than tweets and likes (see above). This association is fortunate because it indicates that comments can serve as a suitable proxy for the popularity of posts when we consider data from the other websites, for which page view and tweet/like data have not been collected. Next time, we will consider how the individual attributes of a post (length, images, etc.) are associated with its popularity.